March 20, 2017, 4:54 PM · In an effort to promote the coverage of live violin performance, Violinist.com each week presents links to reviews of notable concerts and recitals around the world. James Ehnes premiered the Kernis with the Seattle Symphony. The SunBreak: "...this has to count as one of the most challenging solo roles out there, and Ehnes was completely in charge of it." The Seattle Times: "Lengthy, complex and assertive, the new concerto demands almost superhuman agility and stamina of Ehnes, the soloist for whom it was written, and he rose to the challenge." Angelo Xiang Yu performed the Prokofiev's Violin Concerto No. 1 with the Tucson Symphony Orchestra. Arizona Daily Star: "His playing throughout was precise, yet it felt in many ways unscripted, as if Yu could at any moment add just enough of his personality to create something wholly original." Alexander Kerr performed Prokofiev's Violin Concerto No. 1 with the Dallas Symphony Orchestra. Texas Classical Review: "Dallas Symphony concertmaster Alexander Kerr wove a magic spell Thursday night from the moment his bow first touched the strings as soloist for Prokofiev’s Violin Concerto No. 1 with the Dallas Symphony Orchestra." Theater Jones: "If it was a strain to hear Kerr, it was worth the work." The Dallas Morning News: "This was really fabulous playing, marred only by a tendency to rush phrases, mainly in the first movement." Eric Gratz performed Bartók's Violin Concerto No. 1 with the San Antonio Symphony. San Antonio Express-News: "Gratz convinced the 1,000 or so audience members of the Bartók concerto’s value as the piece expressed the composer’s idealizations of two sides of Geyer’s personality, introspective in the first movement, turning cheerful and witty in the second." Nicola Benedetti performed Bruch's Violin Concerto No. 1 and the Brahms with the Royal Scottish National Orchestra. Palm Beach Daily News: "Soloist Nicola Benedetti brought her finest violin playing, from her superior handling of the soaring runs and the numerous challenging double stops to the gorgeous tone created in every note." Palm Beach Daily News: "Benedetti’s muscular tone and solid technique were impressive, and the musical rapport between her and Oundjian was obvious throughout the performance." 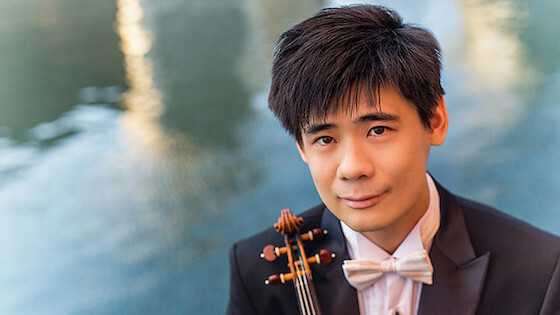 South Florida Classical Review: "It’s not a promising sign when a music stand is set up for the solo violinist in one of the most famous concertos in the repertoire. And when Benedetti came on stage, she gave a shaky, monotonous, underprojected account, sounding more like an advanced student than an international concert soloist." The Scotsman: "In Glasgow, her Brahms was equally vital, expansively phrased and teasingly interactive with Oundjian’s alert players." Gil Shaham performed the Barber with the San Francisco Symphony. San Francisco Chronicle: "Shaham swept into the first movement in a rush of opulent string tone, bringing with him a wealth of instrumental color and fine-grained yet forceful phrasing."" Sayaka Shoji performed Prokofiev's Violin Concerto No. 2 with the St. Petersburg Philharmonic. The Orange County Register: "Playing a 1729 Stradivarius, she displayed a tone that was luxurious in the lower registers, especially at the beginning, and sweet as she ascended to the upper reaches in the second movement." Nurit Bar-Josef performed Mozart's Violin Concerto No. 3 with the National Symphony Orchestra. The Washington Post: "Bar-Josef has a singing tone, too, and she hit all the notes accurately, although not quite lingering and singing with them as she might have, while the orchestra, a little ploddingly, backed her up." Simone Porter performed the Mendelssohn with the Minnesota Orchestra. St. Paul Pioneer Press: "The 20-year-old rising star delivered a performance full of emotional expressiveness, gliding smoothly through the fastest passages or squeezing every drop of melancholy from the slow movement. Add some imaginative approaches to familiar phrases and you have a concert centerpiece that glowed brightly." March 21, 2017 at 03:38 PM · Salini Impregilo celebrates Toscanini, an artist who distinguished himself in the music industry thanks to his talent and dedication. A book on his life has been recently published and will be available in bookshops around the world.